The SLO Botanical Garden Children’s Garden Team went above and beyond with a kid-focused, educational, purposeful, and FUN afternoon on March 21st! Before the Play Meadow Ground- breaking, the kids were given a lesson about some common plants and how they grow from seed. They picked beans off the vine and happily munched them, along with cabbage, carrots and radishes grown right at their feet. They made their own paper pots and planted succulents to take home. We toured the Children’s Garden which blooms with an abundance of outdoor activity: a wonderful climbing tree, a teepee made of branches, an edible garden, and the “Imagination Village” filled with pinecones, lava rocks, shells and palm fronds for the kids to build sculptures. Then the digging began! 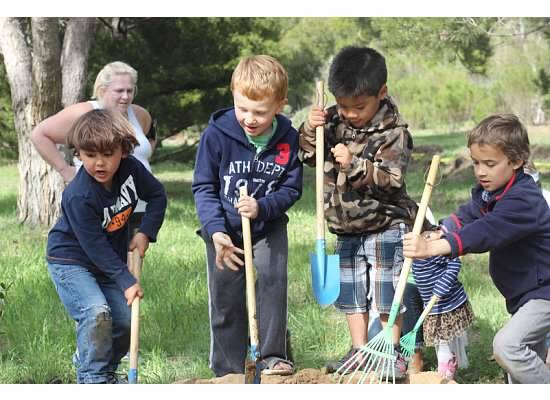 Shovels and trowels in hand, our kids officially broke ground on the new Native Plant Play Meadow. We were hosted by SLOBG Education Manager Lindsey Collinsworth and several volunteers who showed the kids how to dig the right size hole and transfer the plants from pot to ground. The Play Meadow will transform an invasive weed-filled lot into a home for many beautiful and useful California native plants and the animals that depend on them. The Meadow is designed to connect the current Children’s Garden to the surrounding chaparral area and Discovery Hiking Trail. Several kids hiked to the top of the trail for a great view of our amazing local landscape. We were honored to help with the groundbreaking and impressed with the wonderful program the volunteers put on for our kids.